Submitted by CAphyl on January 29, 2015 – 12:28pm. I have never made this bread before, so I thought I would give it a try. I modified the original recipe a bit, as I have described below. Another TFLer found the recipe, and I used that, with some modifications. The original recipe link shows how to build the 100% rye starter from scratch, but I used my existing starter and saved that step. I really liked the dough once it came together. For a tartine dough, it didn’t seem to have enough hydration, so I added a bit more water than the recipe called for. After that, and the addition of the salt and the olive oil, I just loved the dough. It had a wonderful silky feel. Just had some with butter, and it was really tasty. 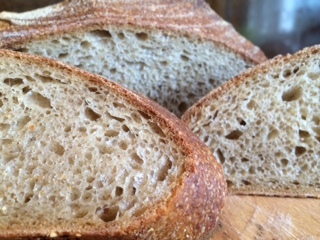 Very moist, nice crumb. My husband made a corn beef sandwich and really enjoyed it. 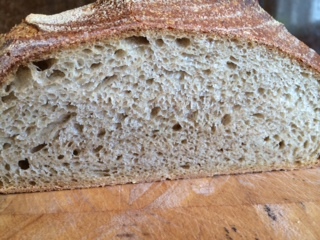 I baked it in my LaCloche and had a slight bit of sticking as the dough rose above the lip of the banneton and didn’t want to come out when I turned it upside down. I was afraid of this and had even added more brown rice flour to the banneton before I popped the dough in! It landed on the side of the LaCloche tray, but I was able to shake it back to a better position. As a result, the shape wasn’t a perfect boule, but worse things can happen. I guess I have learned with enough of these mistakes to make the best of it. I started this and left it on the counter overnight at room temperature. I had mixed the rye with my AP/WW/rye starter mix, so it wasn’t 100% rye starter as the recipe called for. However, it responded beautifully and really popped overnight. You have got to love a rye starter. It was a bit crazy, but it made about exactly the 250 grams required for the recipe. Combine all ingredients minus the salt and olive oil. Autolyse for about one hour. Add salt plus olive oil and incorporate. 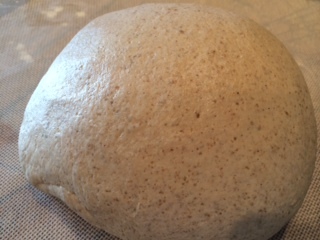 At this point, I really gave it a knead in the bowl to incorporate the ingredients as another blogger mentioned she did not do this and didn’t feel she got the proper gluten development and suggested a bit of a knead at this point rather than a turn or stretch and fold. For first two hours do stretch and fold every half hour. (I had some schedule issues and let it sit out a lot longer and did stretch and folds over a longer period of time, perhaps even four hours before I put it in the fridge for the bulk fermentation. 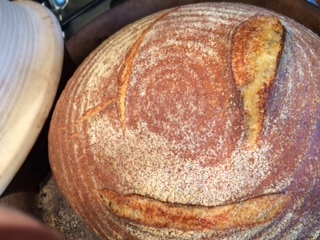 I really liked how the bread responded and actually seemed to become more like the Tartine dough I have worked with before. For last two hours of bulk fermentation finish off in the fridge. Take out of fridge, do first shaping and let rest for 15 minutes. Then do final shaping, pop into your banneton and final proof in the fridge overnight. (It really came up by morning; I was impressed. It does not need much counter time to pop up, so don’t leave it out of the fridge very long before baking). Bake: I baked my loaf in the LaCloche covered baker, preheating the lid and bottom at 500F and baking for 30 minutes with the cover on and then 15 minutes with it off, lowering the temperature to 435F convention. You can also bake with normal steam, 450F or 235C for 40 45 mins, turn the loaves half way through the bake. « Parameters to help you evaluate yourself the breads you make.